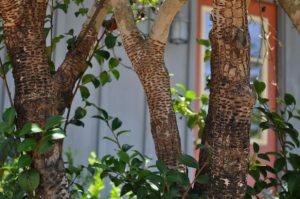 Every summer I receive calls about damage to trees and shrubs. The caller usually believes that an insect is the culprit of the damage. I ask some questions after hearing the concerns of the caller. What parts of the plant are damaged? Is the damage linear or in rows? The trunk and/or main limbs are damaged. The damage looks like a series of holes. Yes the holes are in a line. The damage is mostly uniform around the trunk and/or limb. I inform the caller that the likely culprit is the yellow-bellied sapsucker. This bird is commonly found in both rural and urban areas of southwest Alabama. The sapsucker is a woodpecker but differs from other woodpeckers by its feeding action. The sapsucker will drill a series of holes into a tree. The sapsucker will feed upon some of the sap but mainly uses the sap to attract insects which it feeds on. Usually the damage is of little to no permanent damage to the plant. If the plant is young or stressed, the damage can lead to a decline in the plant. The holes do increase the ability of certain decay pathogens to enter the tree and can affect the shape of the areas damaged. Some trees in the yard can be damaged more than others. The best way to reduce the damage is to try to scare the bird away by using a rubber snake, plastic owl, or a pie tin. The items will need to be moved around in the plant each week to keep the bird from becoming accustomed to them. I do not know of any sprays that can be used to deter the birds.